Truffle or tartufo is a highly-prized 'diamond' in the kitchens of the Western world, notably Italian and French culinary universe. The pungent bulbous lump is often served fresh uncooked, thinly shaved atop of an exquisite dish, the best (and most expensive) topping one could ever ask. Truffle's most prized quality is in its unique aroma, think about musky scent, earthy like fresh soil at the end of rainy season. The taste and texture do not really leave much to talk about, except the appearance of its cross section, which reveals intricate and extensive pale coloured marbled veins. 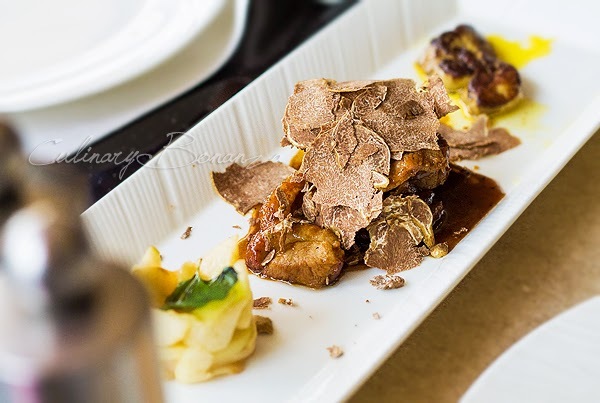 Truffle has a number of families, depending on the regions they grow on, but the most popular varieties known in the culinary world are the White truffles come from Alba in the Piedmont region of Italy and the Black truffles of Périgord in southwest France. 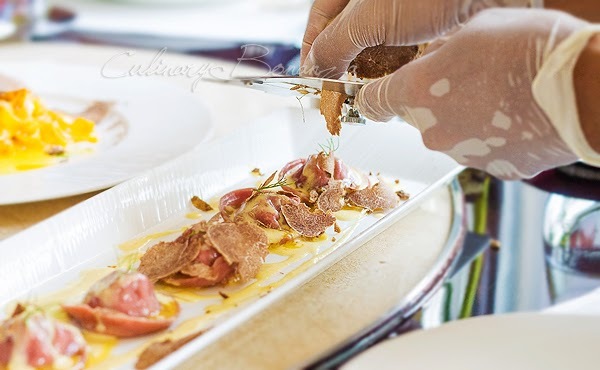 The Italian truffle is generally considered to be superior, in terms of smell and taste, to the French black truffle. The difference is also due to the fact that the black one could be cultivated, whereas the white ones can only grow naturally and the acquire these white pearls, the collectors would either dispatch female swines or truffle dogs that are trained since they were pups. It's a long term investment and the fruition is not something man could control, because the weather, soil condition and other environmental factors play a part in determining the year's harvest of truffle. Too dry a season would result in shriveled truffles that lack in aroma and unpleasant texture, too wet a season and the truffle are might be spoiled by the moss. My first time tasting the stuff named truffle was a few years ago, but even then does not really qualify as a real experience, because what I had, had actually been truffle oil, not the real shaved truffle. The truffle oil smelled like kerosene so pungent you can smell it from far away. Despite that, funny how it still intoxicated me, a truffle virgin. 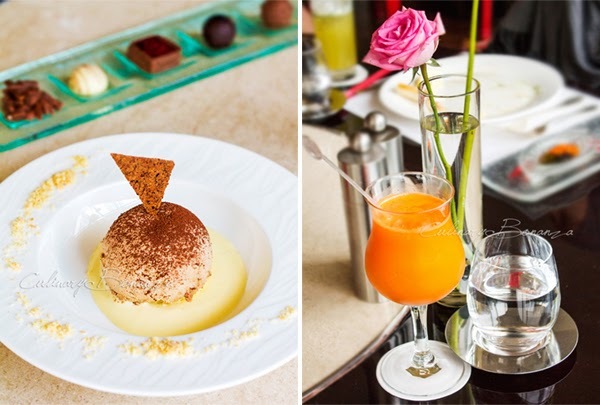 Ever since then, I was addicted and drawn to truffle like ants to sweets. 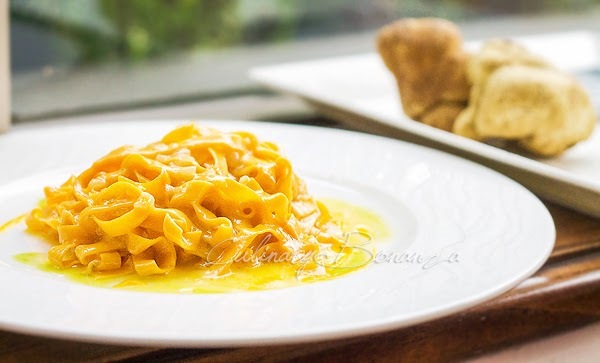 Oh, all the misconception and misunderstanding with truffle oil! Even I, had once thought how wonderful it is to put truffle oil in everything I eat. And I'd happily ordered anything that remotely says 'truffle', without suspecting the nature of the oil. Truffle oil is not even made of real truffle, it's actually olive oil infused with an organic compound intrinsic to real truffles, 2,4-Dithiapentane. No wonder the likes of Gordon Ramsay find the use of truffle oil in cooking as an un-redeemable sin! What a blasphemy it is to replace the real exquisite and rare tuber with the lab-created impostor! I find it ridiculous that anyone would actually pay a fortune for a bottle of truffle oil, that's not made of a single bit of truffle at all. Against my desire, luckily, I decided not to buy it sometime ago. Truffle is best consumed raw because cooking actually destroys or alters the organic chemical compound. 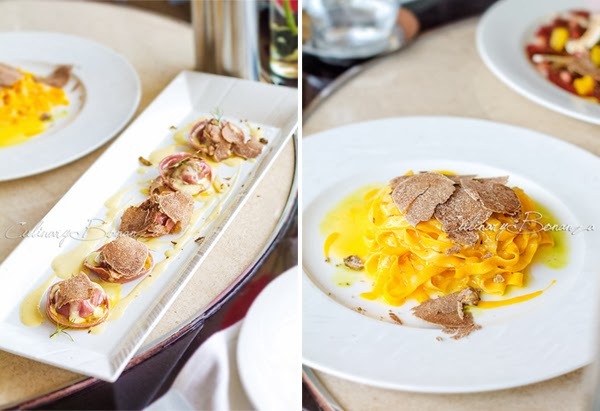 The same as white asparagus, truffles are often enjoyed with the simplest egg dish. Even better, truffle chunks can be added to butter to make truffle butter and spread on buns. 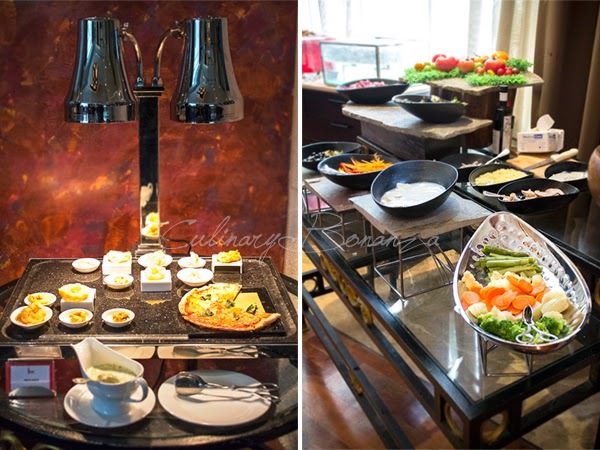 This time round of the year, restaurants in Jakarta are not missing out on the action too. 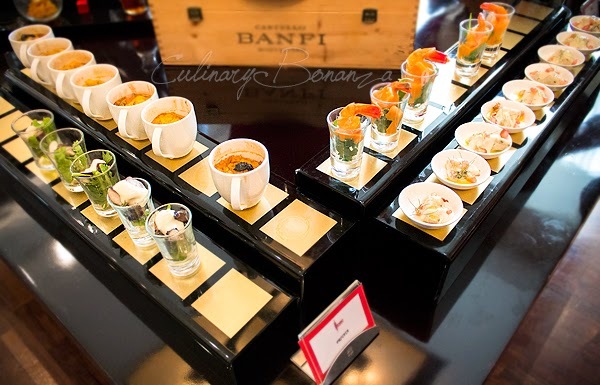 It is their time to show off the chefs' exquisite creations with the blo*dy expensive diamonds, such as at Rosso of Shangri-la Jakarta. Although it is not the only place that offers white truffle as their special of the months, for two years in a row, I had enjoyed the White Truffle Promotion at Rosso. 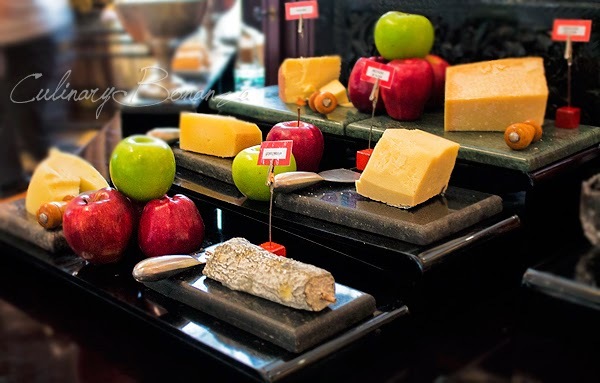 The ethereal truffle lunch began with a spread of Antipasti Buffet, now a regular fixture at Rosso for lunch time, where guests are treated to a large selection of specialty Antipasti, Italian Cheeses, Italian cold cuts, bread, salad and other fresh produce. 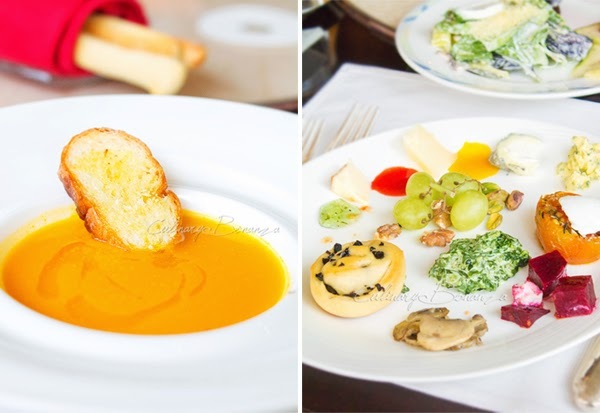 Soup of the day was pumpkin soup infused with olive oil and served with a slice of garlic bread. 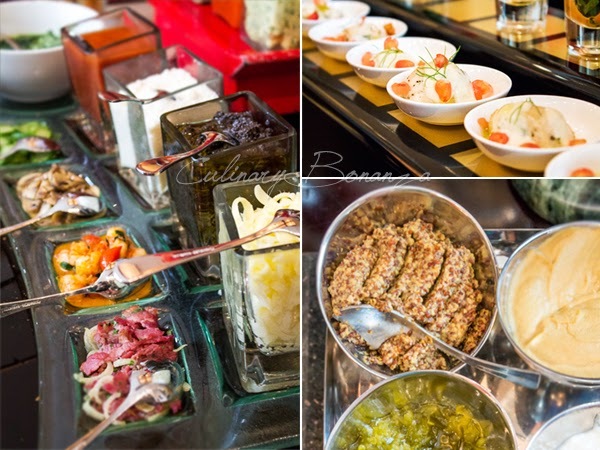 The picture on the right was the prize for my forage at the Antipasti Buffet area. There were meat, ham, cold cuts, salmon and other meat-based items, but I didn't pick them up as I'm on a lacto-ovo vegetarian diet. Oh I must strongly recommend the creamed spinach, it was simply divine! The best I've ever had in my life, I swear. 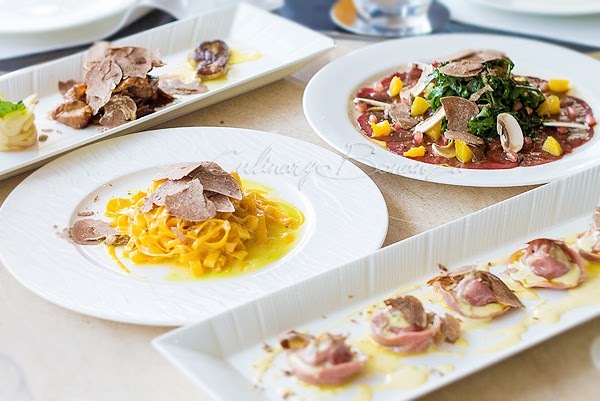 Then we moved on to the White Truffle Promotion at Rosso, Shangri-la Jakarta, which can be enjoyed between 9 - 30 November 2013. 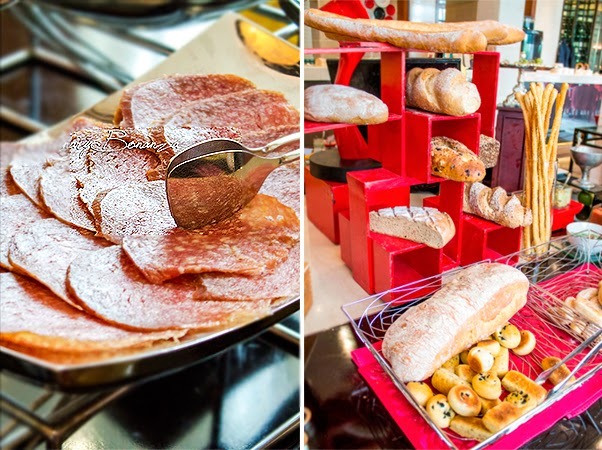 Now, brace yourselves for a feast fit for the Pope himself! Crudo of Wagyu beef tenderloin with truffle and Parmigiano 36 months. 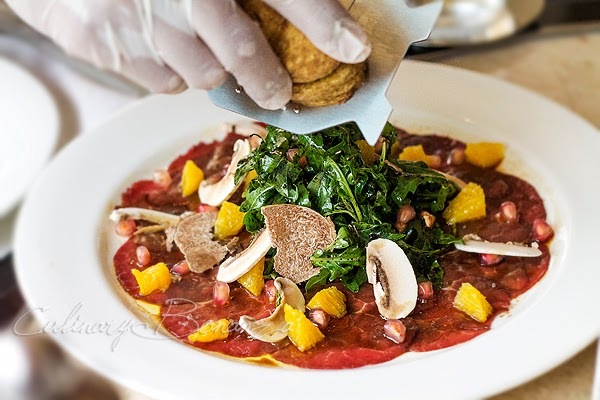 The thinly sliced beef carpaccio is served with rocket salad in balsamic vinegar, raw sliced mushroom, orange bits and topped with white truffle. After-truffle, ta-dah! I could eat these for the rest of my life, period, case closed. I think I should've been born an Italian, because I have such an inexplicable affinity for pastas! Seared duck breast tartare, foie gras, apple terrine and white truffle. Although I did not actually eat this dish (I just picked from the apple terrine) from what my friends said, the foie gras was really delightful. I believe them, no questions asked, foie gras and white truffle in the same plate, got to admit I was absolutely foolish to miss out on this. Oh well, at least my friends are happy as they get a greater share. The Semifreddo al Torroncino or nougat semifreddo ice cream with hazelnuts reminds me of Nutella (probably because of the hazelnut), together with the chocolate truffles and pralines, made a perfect epilogue to end such a divine lunch. 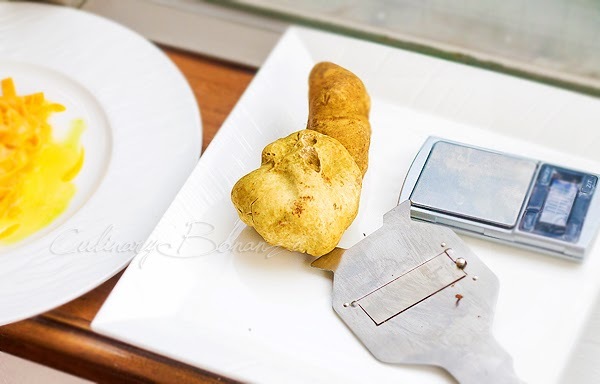 Additional Alba white truffle can be added upon request at IDR 500,000 /3 grams.